I’m not here to argue if fat, or saturated fat in particular, is healthy or not, that is a topic for another day. However, this entire conflict in interest would make the “anti-obesity” concern seem just a wee bit insincere, don’t you think? Dairy Management Inc. is basically the PR company for the dairy industry. They work with The Dairy Council and are (generously) funded by the dairy industry and the United States Department of Agriculture. Their goal is to increase dairy consumption, period. In fact, as reported by the New York Times, it appears that they have little concern for public health. Dairy Management documents state that their target audience is those whose love for cheese is greater than their concern for health risks. Okay, so the overall message from the USDA and Dairy Management is: If you care about your health, cut back on cheese, if you don’t, eat more? So they are basically labeling the target audience for the Domino’s and other cheese campaigns as the lowest common denominator? Now isn’t that sweet. So how about some cheese consumption facts? In my book, Go Dairy Free: The Guide and Cookbook, there is a section called “The Cheese Generation: Where Would You Like That Extra 32.5lbs?” that addresses the increase in cheese consumption in accordance with the rise in obesity in the U.S. As reported by the USDA (they seem to be the center of our food universe in every way, no? ), America’s appetite for cheese has grown from 7.7 lbs per capita per year in the 1950’s to 32.5 lbs in 2006! Yes, a 420% increase! 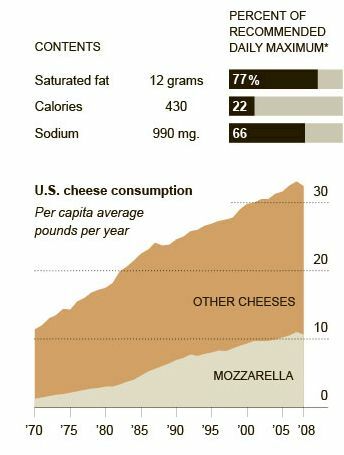 It seems the New York Times follows my work, and has even created a nifty little graph of cheese consumption to go along with it. How cool is that? As you can see, there has been a recent dip in the increase of cheese consumption … a major concern for Dairy Management, and a possible reason to team up with a major pizza chain. 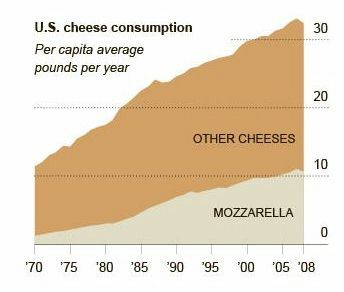 In 2002, another time when you can see that cheese consumption was slowing (in the graph above), Dairy Management sponsored a similar type of campaign, but that time with Pizza Hut for their “Summer of Cheese.” It resulted in another 102 million lbs of cheese sales. 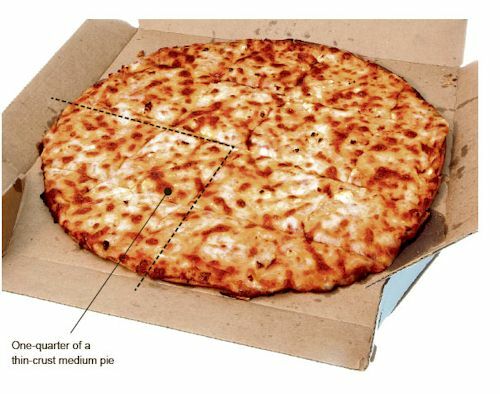 If a single campaign can make that big of a difference in one summer, how much cheese could a year round promotion from Domino’s add to our per capita diets? *shudders* commercial pizza, and in particular American pizza is disgusting. I am SO SO glad my body now rejects it. Great post!!! I would also liken this to the government’s inability to come clean and tell us all to stop drinking soda and avoid HFCS. Both are great examples of how we can’t really believe any health claims or stories the government wants to tell us, because their interests are much deeper than simply our health. It’s a shame, really, because it prevents us from having an honest discussion about what these types of foods are doing to our health. Instead it becomes a “personal choice” for us to have to make, despite efforts to shield us from the truth. Scary to think that our own government isn’t looking out for our interests. Alisa, great post! I’ll be rereading your book later this week. I’m recommitting AGAIN to dairy free. Tired of snoring, congestion, weepy eyes, crusty eyes … oh, and that (at least) 32.5 lbs hanging around. That’s such an interesting number because the last time I went dairy free, I lost 33 lbs with no problems. As if the USDA weren’t sending out enough mixed messages already, now there is this. I am surprised, but not surprised. How sad is that?